Line-caught wild squid from the South West coast, prepared and cleaned. 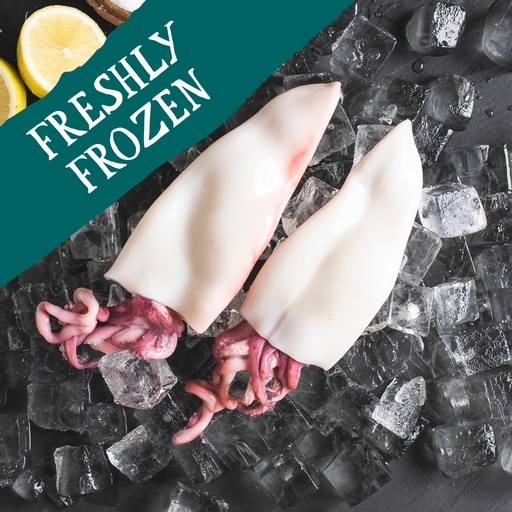 The firm white body is easily stuffed or sliced – and though the tentacles may look a bit sci-fi, they are just as delectable as the flesh, if not more so. Squid’s delicate seafood taste pairs well with most flavours and cuisines, from lemon and parsley to Asian spices, or even dark, sticky stews. Our favourite is a simple salt-and-pepper squid with sweet chilli sauce. Serves 2. Delivered in insulated packaging to keep cool on your doorstep. Minimum meat & fish order £15 to cover the cost of the packaging. Don’t miss our wild squid. We buy from small local fishermen, so supplies are limited. It will be available for deliveries from 18th February, while stocks last. There are only 2 ways to cook squid: very fast or very slow. Anywhere in the middle and you get the rubbery texture that puts many people off for life. You can slice them into classic calamari-style rings or open up the body and score it with a criss-cross pattern before slicing. Slow-cook them into a seafood stew or fry quickly in a searingly hot pan. They are best dusted in a little seasoned flour and deep fried for a couple of minutes until crisp. Alternatively, you can keep the body whole and stuff it with all manner of tasty things (including the coarsely chopped tentacles) before slowly braising in a rich, winey tomato sauce for 45 minutes. Keep in the fridge below 5˚C. Pre-frozen, not suitable for home freezing. We guarantee that your fish order will have at least 5 days before its expiry date, including the day of your delivery. Our very limited range of seafood is based on what our research shows to be fishable in an ethical and sustainable way. We only support small-scale, non-industrial fishers local to us (mostly in Devon and Cornwall). The catch is always line-caught by day boats under 10 metres long, and we have full traceability from the boat to your door. All catches are iced at sea, then expertly prepared, packed and blast frozen within 24 hours. Freezing the fish ensures it is fresh at the point of eating; fish from industrial-scale boats may have a much longer journey before it is frozen. Freezing the fish enables us to catch them when they are prevalent in our local seas and balance supply and demand (e.g. you can still get fish if the boats can’t get out in rough weather). Our blind taste tests found no impact from freezing on flavour or texture. For more info, please see our fish manifesto and FAQs. Prepared in a kitchen where nuts, Fish, Shellfish, Crustacea, Molluscs, Cephalopods, Eggs, Dairy, Gluten, Celery, Mustard, Soya and Sesame are also handled.